Outwood Electrical provide a wide range of professional electrical services to homeowners and companies around Manchester and all surrounding areas. We’re a family-run electrician company specialising in rewiring, under floor heating installation, inspection and testing, security solutions and fault finding. Our team have established a fantastic reputation in and around Manchester and Greater Manchester, and take great efforts to deliver flawless customer service with every job they take on. 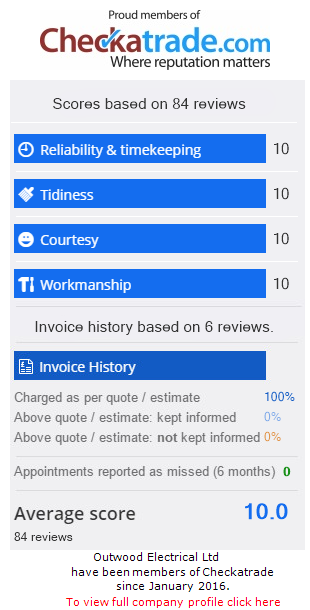 This is reflected in our 9.96 rating on industry reputation website Checkatrade, a rating that we’re very proud of but always looking to improve. If you’re searching for a highly qualified, insured Electrician in Manchester choose Outwood Electrical.